Being a big-name team of experienced professionals and using advanced engineering technology, we are engaged in manufacturing a broad range of Hydro Extractor. Used for washing, dyeing, enzyme, bleaching, these laundry machines are provided in thermal fluid options & steam, electric. 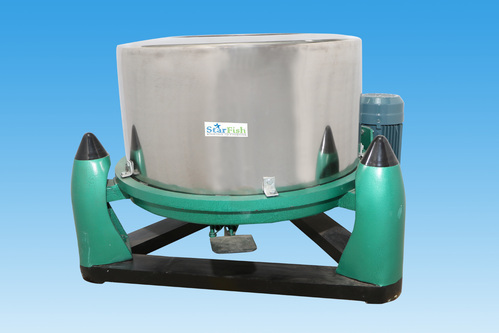 Offered Hydro Extractor are developed using high quality material and state of the art technology. Our synthesized laundry machines are well known for their good accomplish & perfection. Non Coaxial Hydro Extractor is impenetrable and needs less maintenance with all stainless Steel inner and outer drum of 304 Grade. The machine requires less operation with a silent shaking during running. It has both Electrical and Mechanical braking systems that can be used as per suitability. Our Hydro extractors are solid and reliable equipment functioning on the unique principle of centrifugal force. Complete water extraction up to 70%, ensuring very low moisture retention. This reduces drying time considerably. It is self-balancing and is fitted with a single phase preventer and motor protecting relay for safety and easy maintenance. The capacity of the machine is from 15 to 400 kg enabling bulk load to proceed in a single run.